There’s something about actor appearances in movies that are released after they’ve died. Imagined or not, there’s a special aura surrounding them. We’re looking for messages, something to give us closure. A final line, a last look into the camera, something to wrap up their lives on Earth that ended too early. When you watch A Most Wanted Man it’s hard to not come across those thoughts, since it’s got Philip Seymour Hoffman in the leading role. Even the title of the movie points right at it: a most wanted man he is indeed, there isn’t anyone who wouldn’t want him to be alive with many, many more movies to come. So how about the signs, are there any? There are different opinions in the party as we’re watching the film. Some of us think he looks worn out, with difficulties to move and breath, in a terrible shape, foreboding what would come. I disagree, claiming that it really is the role he’s playing and that it doesn’t tell anything about his private person. But we can agree on that the presence of PSH is the biggest reason to watch the movie. His emotional reaction when a certain thing happens – so convincing. Every character he played, he made believable, alive, and this is no exception. I’m trying to think of this movie without PSH. Would it be as good as it is? I’m doubtful. It does feel a little bleak. Cigarettes are smoked, whiskey is drunk, bands of trust are formed and broken. You don’t quite know who to trust and distrust. It’s a little like watching a version of Homeland after draining it on blood and sweat. Excitement lies in if someone is going to sign or not sign a paper. It’s based on a John le Carré novel and this is exactly how I imagine that his books are. I haven’t read a word by him; I’ve only seen my father reading them. It’s the kind of books that fathers read, isn’t it? You can sense the relationship to Tinker Tailor Soldier Spy. However unlike the case of that film, I can actually follow the plot this time. It makes me feel if not smart, at least not stupid. And here I should say something about Hamburg. The reason why I’m posting this right now is that we’re running a theme among Swedish movie bloggers where we’re all supposed to write about movies that take place in German cities. How convenient wasn’t it that I just had watched a movie that took place in Hamburg! There is Hamburg. There are conspiracies. But most of all there’s PSH. Not enough PSH. There never can be. Oh, and the movie is just fine. Hey, we wrote about the same film today. Are you as lazy as I am? LOL. Well, I have read a lot of le Carré’s novels, and I love most of them. I really liked this adaptation, it is in the same division as Tinke tailor soldier spy. I think it is way better than “just fine”, maybe “actually great” would be my wording, but we reached the same rating anyways (due to different rating scales I would say). Yeah, I took the easy way here as well. I’ve got too many movies to write about in the queue as it is. I liked TTSS too, but to be honest I was pretty clueless about the plot. This one was much more enjoyable in that aspect. I think I would have loved this a little more than I did if I hadn’t just come from a high pulse action movie. Now it felt a litle pale. 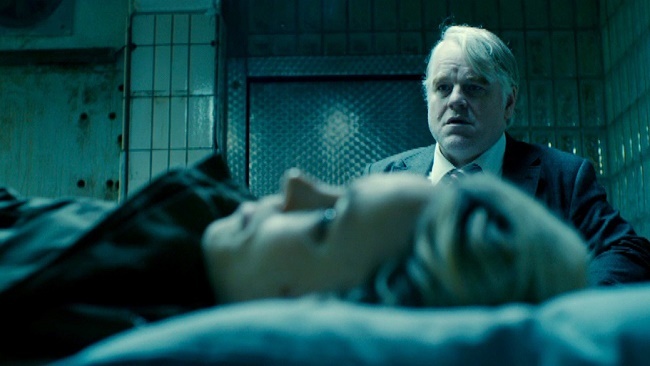 I miss Philip Seymour Hoffman, I miss him so much. And he is truly great in this one! I belong to those who saw his appearance as belonging to the part and not a sort of foreboding. Also, since I’m not a die hard fan of PSH and thought that that character was rather generic I feel I can easily see quite a few other actors playing Günther. Brian Cox, for example. Or Albert Finney. I thought he was so perfect for this role, but you’re probably right. It is a type of hero that we’ve seen quite a bit. Great review. PSH will be sorely missed. He was one of the greats.